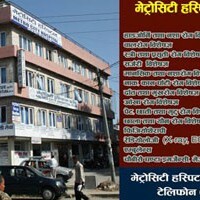 Metrocity Hospital (MCH) is a general hospital located in Srijanachowk, Pokhara, Nepal, situated about 200 km. west, from the capital, Kathmandu. MCH is formally established on 16th of BHADRA 2066 (Septemer 1st 2009) and is a multi-disciplinary center and comprised of a modern state-of-the-art in varied disciplines of health and one of the best Hospital in Pokhara and services includes Internal Medicine, General Surgery,orthopedic Surgery, ENT, Eye, Gynecology & Obstetrics, Dermatology, Pediatrics and neonatology, Psychiatry,Radiology, orthotics and Physiotherapy. The hospital also provides Pathological and Diagnostic facilities. Besides Inpatient service to the admitted patients, also provide outpatient specialty clinics along with the 24 hour Emergency Reception and ambulance Services. The excellence in both the fields of medicine and surgery is the motto of our hospital which range from all types of medical, pediatrics and Neonatal management to laparoscopic surgery in general surgery, ENT, Eye and gynecology & obstetrics to arthroscopic procedures in orthopedic surgery. The patients from other disciplines are also managed with utmost care in our hospital. We possess the best equipped and professionally managed pediatrics and Neonatal care unit. (NCU), Safe abortion service (SAS), immunization,orthopedics and Trauma, EEG and family planning. Our hospital has highly qualified medical consultants supported by highly qualified and skilled professional health care staffs and is dedicated to the best service of this region.